The National Retail Services capabilities of H.J. 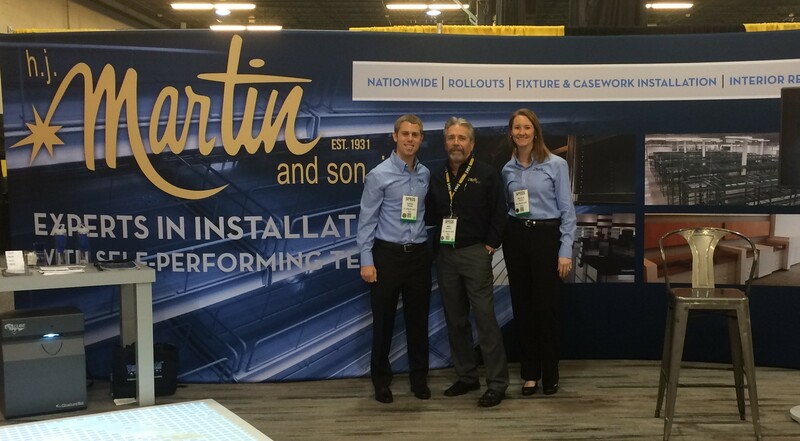 Martin and Son were highlighted at the 52nd annual SPECS event, held March 13-15, 2016, in Dallas. Standing for Store Planning, Equipment, Construction and Facilities Services, SPECS is attended by retail and food-service corporate executives who are involved in the planning, design, construction and maintenance of stores and restaurants nationwide. All retail chains – in the areas of specialty, supermarkets, discount, drug, department, home center, warehouse clubs, convenience and restaurants – are represented by headquarters executives at SPECS. Produced by Chain Store Age magazine, SPECS offers educational opportunities, the chance to exchange ideas and the ability to develop new partnerships. H.J. Martin and Son was represented at SPECS by fourth-generation executive David Martin, Director of Marketing Nicole Jensky and Project Manager Bret Bohlen, who works with many of the company’s national retail accounts. Miami Heat President (and hall of fame coach) Pat Riley gave the event’s keynote address on March 14. Riley spoke to the SPECS attendees on “The Winner Within.” The following day, political commentators Paul Begala and Tucker Carlson discussed the 2016 run for the presidency. This year’s SPECS conference wrapped up with an appreciation event at House of Blues. SPECS 2017 will be held next March 12-14 in Kissimmee, Fla.